*It has been well known that Our Lady in the Original Image was pregnant with the Baby Jesus. In the Special Photograph, the signs of Our Lady’s pregnancy are no longer seen. Instead, you can see the Holy Eucharist (=Jesus born of Our Lady) above Our Lady’s two gathered hands and also the bright and powerful light before Our Lady which must be the Divine Light (from Jesus) to spiritually feed us with the grace and to expel Satan and all evil souls from us and from around us. *The Image of the Holy Spirit above Our Lady’s right shoulder must mean that He is supporting Our Lady. *Our Lady’s large Immaculate Heart in which she will protect us. This Heart is visible under her left arm. *Under the Divine Light, a small Image of Our Lady is kneeling and praying for unborn babies. It appears that she is also weeping. Her prayers will surely be granted by God the Father. Let’s also pray with Our Lady. *Our Lady is not wearing the veil, instead probably she is ready to receive the Royal Crown from the Trinity. *The size of the Special Photograph can be big or small. 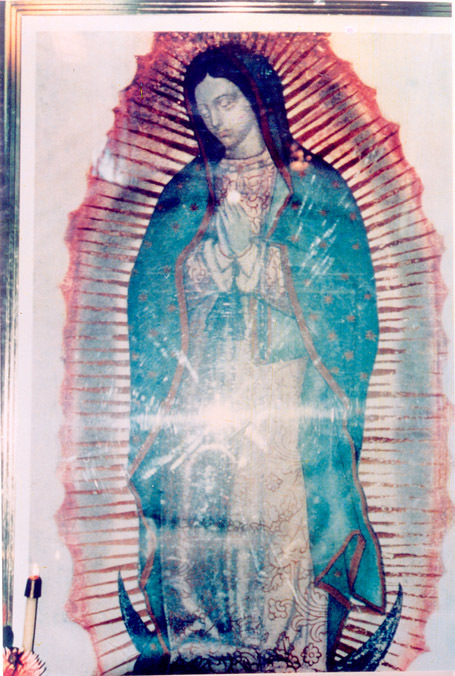 It is believed that Our Lady of the Original Image has been living and present especially when people look at her with trust, faith, gratitude, and love. The small size photos can relatively easily distributed worldwide and Our Heavenly Mother can embrace each and every person, old, young, baby, and the sick all over the world and can spiritually nurse us. *Several miracles have already occurred and given consolation and hope to many in Portland. As we become more believing, trusting, and loving Our Lord and Our Lady, there will surely be many more blessings and miracles. Remember, Our Lady in the Special Photograph is the same as the living Our Lady in Heaven and her Image was given to us by God. Every person in the world should have one or more Special Photos. If you have sincere faith and will, she will help you and give you happiness that cannot be found elsewhere.